The Baldwin Supply team would like to wish you a Happy New Year. 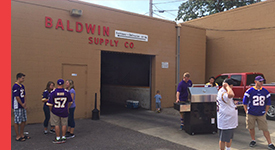 Baldwin Supply truly values your partnership and we want to thank you for your continued patronage. We look forward to a prosperous 2017 together! BSC locations will be closed on January 2nd, 2017. We are always available if needed. Please contact sales or your branch's after-hours phone number.